March 7-- Mrs. Carolyn Jean Thompson, age 74, of the Ohoopee Community died Tuesday March 5, 2019 at Memorial Health of Savannah after a brief illness. 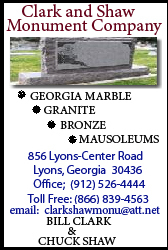 Mrs. Thompson was a native and lifelong resident of Toombs County. She worked as a Security Officer at GA Power where she retired after 14 years of service. She loved people and regularly attended Mt. Vernon Church of God, New Beginning Church of God and Ohoopee Baptist Church. Mrs. Thompson is preceded in death by her husband, Robert Thompson; her daughter, Patricia Lewis; and her mother-in-law Ila Mae Thompson. Carolyn is survived by three sons, Robert Daniel Thompson (Cindy) of Lyons, Thomas James Thompson of Vidalia, and Wesley Eugene Thompson of Lyons; three daughters, Janet Chambers of Visalia CA, Martha Jean Garza of Lyons, and Saraha Anne Bryant (Robert) of Lyons; one brother, Thomas James Alder of Hawaii; two sisters, Gwendolyn Furqueron of Seattle WA, and Jeanette Cashin of Lyons; 15 grandchildren and nine great-grandchildren. Funeral services for Mrs. Carolyn Jean Thomspon will be held Sunday, March 10, 2019 at 2:00 PM at Stewart-Rosier Funeral Service Lyons Chapel with Reverend Rodney Gibbs, Reverend Mike Smith and Johnny McCollough officiating. Interment will follow at the Ohoopee Community Cemetery. The family will receive friends for visitation Saturday evening at Stewart-Rosier Funeral Service Lyons Chapel from 6:00 PM until 8:00 PM.